Anyone who knows me in real life knows I LOVE award shows. From the red carpet fashion to the gushy acceptance speeches to the funny hosts, they’re a FUN way to spend an evening. But you know what makes it even more fun…having your BFF’s over for some great food, drinks and snacks so you can watch and add commentary and get cocktail refills during commercials. Today, I have a black tie (or yoga pant) affair party plan for you. I totally realize that hosting a soiree can be intimidating, but my formula for effortless entertaining is this: 50% store bought goodies and 50% stuff I make. Let’s party plan! For the store bought goodies, I got movie theater popcorn, three varieties of movie theater candy for a candy buffet, and mini red velvet cupcakes. Easy, affordable and definite crowd pleasers. For the items I wanted to make, I thought about foods that are easy to eat, filling enough for dinner (let’s face it- with the red carpet and the show, your guests may be around for 4+ hours) and quick to throw together. So, that’s why Daniel and I chose mini/individual 6-layer dips and chicken, bacon, spinach and cheese empanadas. Filling AND delish. Directions: Using a heaping teaspoon of each ingredient above, gently layer each ingredient in a 4 oz. dish. Go in this order: avocado, beans, sour cream, salsa, cheese, tomato. Other topping ideas could include jalapeños, olives or cilantro. You can also make this in a small casserole dish and forgo the individual bowls if you’d like. Directions: Boil your chicken breast in broth until cooked. Shred and let cool. Cook bacon in pan, crumble, drain most of the fat. Sauté spinach in the same pan. Add in chicken and cheeses in the pan to help everything melt together. Add salt/pepper to taste. Transfer to a bowl to cool. Roll out crescent dough and cut 3-inch circles for empanadas. Brush edges with egg wash. Place heaping teaspoon in center of dough, close and crimp edges with a fork. Bake in a 375-degree oven for 11-13 minutes until golden brown. I gotta have a signature cocktail if I’m throwing a get together, but I wanted something light, refreshing and gorgeous. After some trial and error, I came up with a tasty moscato, strawberry and orange juice concoction. Think mimosa meets moscato. Directions: In each glass, place one sliced strawberry. Top with about 1 oz. of orange juice and top off with moscato. The award show itself is the entertainment, but I also created a free printable bingo card. It serves double-duty…guests can write their predictions on the card, and if they’re right, they can cross it off as the show progresses. Opinions will definitely differ, so this is a fun game for sure. The guest to get bingo wins a fun VIP swag bag filled with extra candy, some cute lip balm, an award statuette, and a $10 gift card. Don’t forget to provide pens and a list of the nominees by category. The decor is kept minimal, but there are a few DIY things included in the set-up. There are some award statue centerpieces as well as some food/menu cards that add a bit of pizazz to the set-up. 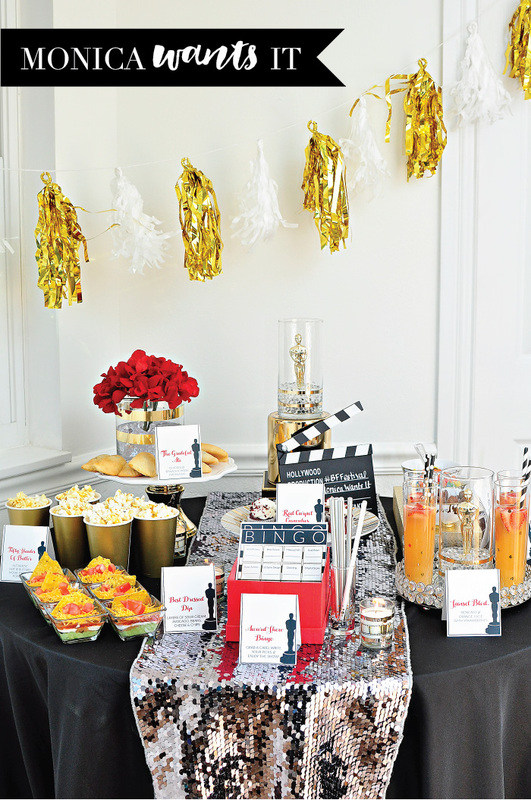 All of the food and decor is pulled together with a simple black tablecloth and silver sequin runner. Instructions: Pour one ounce of water beads into bowl and fill with water. Let sit for 1-2 hours to let beads expand. Use the gold tape to add two bands of gold to the bottom portion of the vase. Place award into vase and while holding it in place, use a spoon to drop in the expanded water beads until the black base is covered. For my main centerpiece, I added height to the centerpiece by using a gift box and a large candle holder flipped upside down. Get creative with items around your home to add height to your food and decor. The little menu cards that you saw above (and below) can be used for menus, food markers and even guest place cards for a more formal dinner party. And much like my approach to food, I chose to buy (rather than make) this gorgeous gold and white garland. I’ll definitely use it often, and it came out less expensive to buy it than DIY it. My final piece of decor was my gold striped vase filled with water beads and topped with a faux red hydrangea. The little arrangement adds a pop of color and class. I hope I provided plenty of ideas for you to host your own movie awards bash. Happy viewing! So cute! I have never seen Seven Layer Dip look tempting as this. Great job, sharing! Thanks for sharing…I love hosting parties. How fun is this. I want to come to your house. The decor and the food are all fabulous. I love all these ideas and your pictures. I will prepare the Moscato Mimosa very soon, it looks delicious!